Having an online store is a great idea. 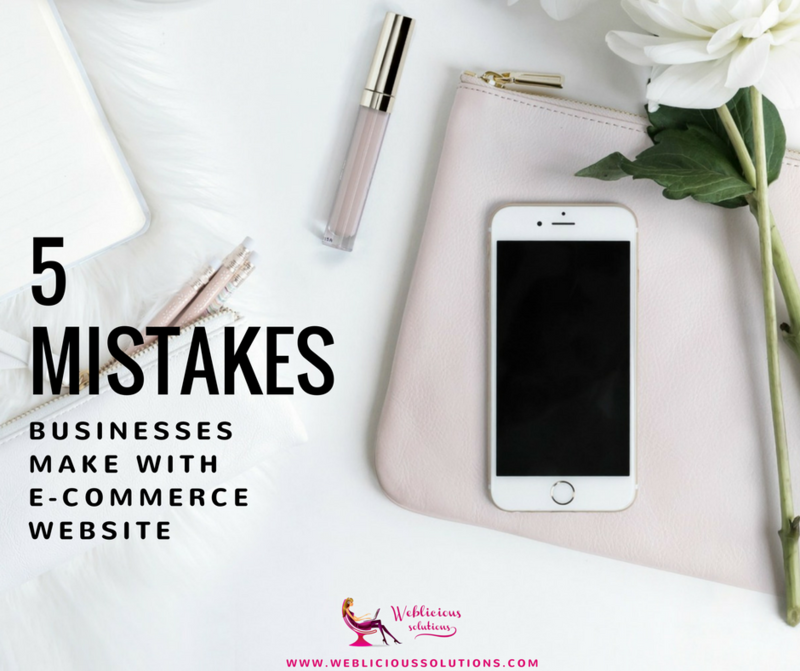 In past year we have build more e-commerce websites then any other types of website, and with that I have seen some common mistakes business owners make with their online store. I hope these help you improve you existing online store or set you up for success with your new store. It’s challenging for a layperson to know what platform is best for your online store and the fact is that most web designers will have their preferred e-commerce platform they like to work with. But is it also good for you? 1 – Will I be able to create new product, update existing products, prices, change images and similar without needing to hire web master? 2 – What are my options to grow my e-store? ability to remarket to your visitors and so on. 3 – What are costs associated of running my online store and future growth? 4 – What if I want to change design in the future? What happens with my existing products and data? 5 – How good are reports about activity in my store? As a business owner and imperative to your marketing is the ability to know exactly what you are selling them most, who’s buying it (demographics), buying behaviours and similar. It is not just about the sales. For a smart marketing, which equals in more sales, you need to dive deeper into your customers’ behaviour and habits. Easy to manage your e-store yourself. Once set up, there is no monthly cost to run it or pay commissions from sales. Used worldwide by many big brands therefore many developers are constantly developing additional functions and really cool solutions to engage with your customers and tools to make your life as an online business easier. Can connect to most payment gateways and shipping providers. You can scale up the functionality of your store mostly with free additional software a small fee. Unlimited design options, where if you wanted to, you could set up your store yourself, without hiring a web designer. Yes, a picture says a thousand words, but when it comes to online shopping, descriptions of products are as important. Unless you are reselling common products that people know about and just looking for a good deal, chances are that they have never seen your product live. Meaning, they don’t know how it feels when you touch it, what it does or how to use it. Good descriptions will sell your products. The more detailed you are the best chances you have of selling it. Think of it this way – if you walk into a store and shop assistant is not really engaging with you about the product you saw for the first time, you’ll probably walk out. If the shopping assistant provides information about the product, you will listen and have better ground of making a purchasing decision. Your product descriptions are your sales assistant online. Give them character, don’t just list all the features. People want to know the benefits; how will the product improve their lives and make them feel. I don’t say they had it easy, because their products vary in weight and they ship from a country that has many challenges, but this is where you need to be smart. The more you can simplify it for yourself the easier it will be also for clients. Shipping cost doesn’t need to be exact. Clients don’t know. You need to be willing to accept that on some products, you will lose and on some win a bit of money for shipping. And that’s ok. Whenever possible use shipping calculator, but if not possible, create your own flat shipping rates that work for you. Few dollars up or down will even out through time, and you can always adjust if necessary. I don’t say you need to hire a professional photographer, but the picture is the first thing that will catch buyer’s attention. If you’re an op-shop or a store selling discounted products that people already know, they don’t care about the image; they only care about good price. If you are a fashion brand or selling your own product then images need to reflect the quality of your product and convince shoppers that they are worth buying. You wouldn’t go in a crappie looking store with clothes lying all over the floor and pay for a product $100+…or would you? If people can’t find your products they can’t buy them. Many times stores want to be clever how they classify/arrange their products. Yes you want to be creative, but use standard classification of product, e.g. if you’re selling dresses put them in category ‘dresses’ so visitors can easily find them. You may use “cool” words that you came up with, but your buyers only know what’s generic, so make it easy for them to shop – use generic names of categories in your navigations. Then use your creativity in product names and descriptions. As for the checkout – make it as smooth a process as possible: add product to a cart, view a cart, proceed to checkout, and make payment – simple as that. You may want to add some upsells and suggestion on cart page…but that’s as far as it goes. Keep it simple and easy for them to buy! As a general rule, when you are creating an online store, first think of what is easy for you to manage on a daily basis that you can scale up without a lot of additional costs. Then your second job is to put yourself in your clients’ shoes. Ask yourself, what do they need to believe about the product in order to buy? Then create images and descriptions accordingly to answer all those questions. Think of whom you are selling to? Who is your avatar? Then make your e-store inviting for that market and simplify. Remove all necessary distractions.